We had a mere three days in Belgium, yet we wanted to see Antwerp, Ghent, Bruges and Brussels! There wasn’t enough time to cycle between all those cities and sightsee, so we made Ghent our home base and took our bikes on the train. The first time in a Belgian train station, we immediately started playing “spot the Brompton”. We were early to the platform, but as more people arrived, so did the bikes! There were a couple Bromptons, then a few more, and then a dozen, and then we lost count! It seemed like every third person on the platform had a folding bike, and of those the majority were Bromptons! In North America our tiny folders attract a lot of attention because they’re so rare. In fact, if you see another Brompton rider in Toronto, you give them the “nod” in recognition that you both have the same cool and unusual folding bicycle. 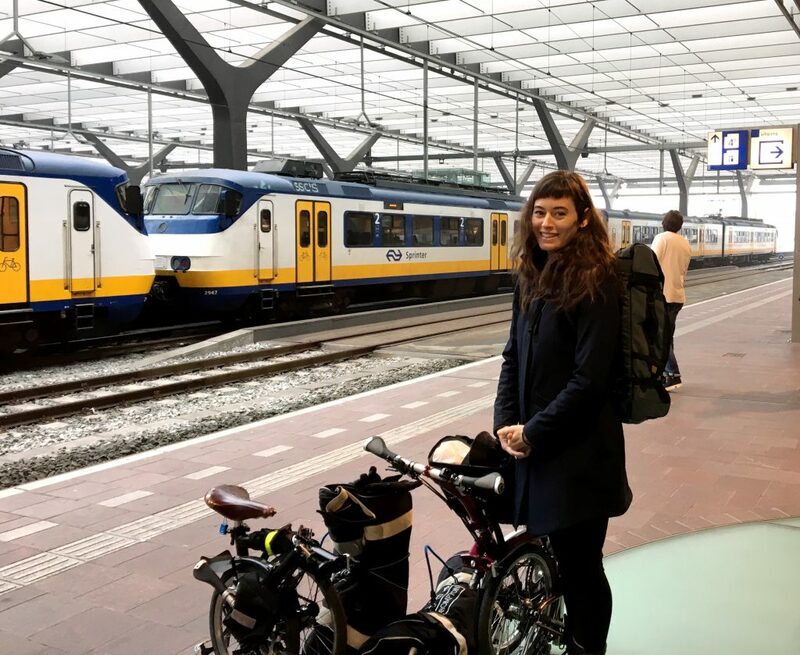 Practical Information: On the longer distance trains like the one we took from Rotterdam to Antwerp, folding bikes go in the train car’s luggage section. But on commuter trains, you just keep the bike with you. 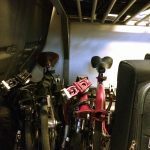 There’s generally a designated “bike car”, which you need to use if you have a full-sized bike, and even with our folders we often looked for this car because it had a bit more space for the bikes. The first Belgian city we visited was Antwerp. We left our bags in the lockers at the train station and rode the five minutes into the heart of the old city. 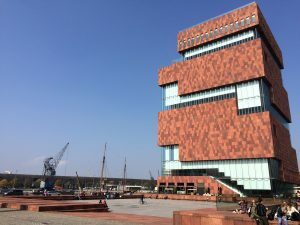 After touring around the outdoor sites, we went into the MAS (Museum can de Stroom) but not to visit the museum, just to go to the rooftop for the panoramic view. Because we don’t like locking the Bromptons up outside, we folded them and walked into the MAS, heading confidently to the escalator when… a security guard stopped us! Oh no, we couldn’t bring our bikes in! 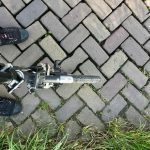 The guard explained that rolling the Bromptons along on their little EZ-wheels could damage the sandstone tiles. 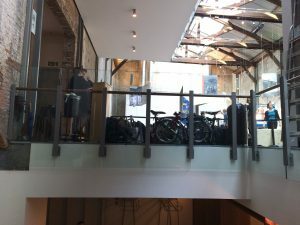 We thought he was going to tell us to park them outside, but instead he motioned for us to carry them behind the security desk and kindly said he would watch the bikes while we went to enjoy the view! 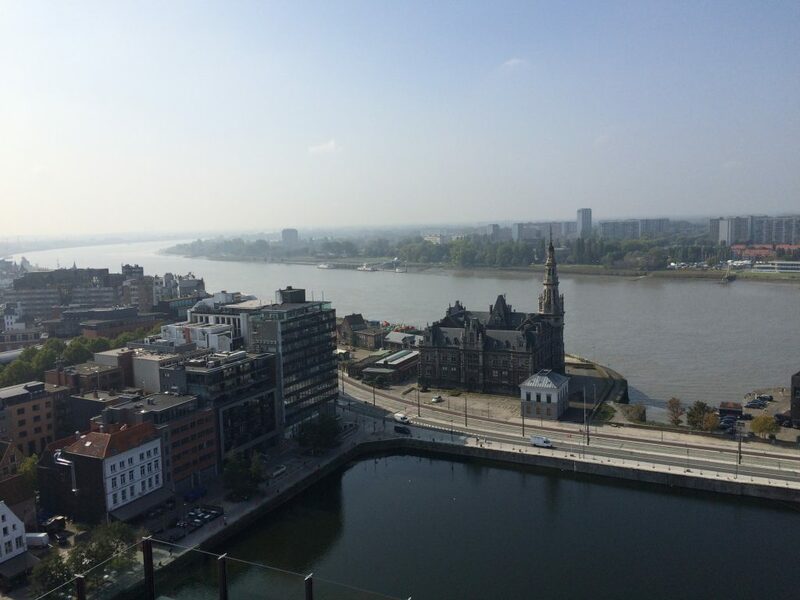 View from the MAS in Antwerp. Bromptons in the Red Line Museum bag check. We did the same thing at the Museum Plantin-Moretus (Printing Press Museum) in Antwerp, the Chocolate Museum in Bruges, and the Parliamentarium and EU Hemicycle in Brussels. In each place, we were able to leave our folded bicycles in the coat/bag check area. So, if you’re traveling in Belgium and, like us, are loath to leave your precious Bromptons outside for fear they’ll be stolen, don’t worry — at most destinations, you can check them just like you would a coat or bag.